Time to trade some surplus 9.8 keys! On offer (for trading) are the following graded books. Yes these are all 9.8 slabs of which I own 2 or more copies, with one for my personal collection and others to trade. Photos are featured below, or are forthcoming. It is not likely that many of you are sitting on multiples of these books. But if you own additional raw books, perhaps this post might inspire submissions. Then return here to barter and fill out your own personal collections. Win-win! 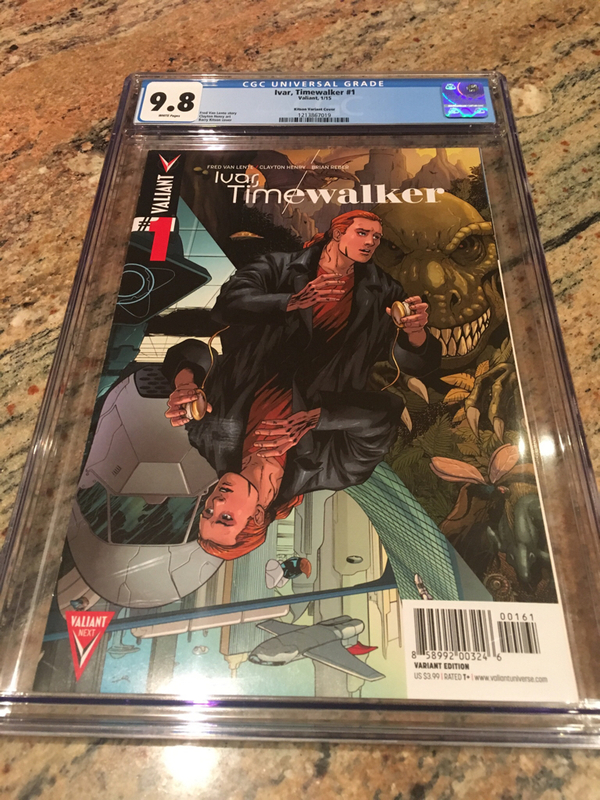 I would consider trading for a raw NM+ or can't-miss-9.8 book, but probably only if there is a good reason that it has not already been submitted to CGC or CBCS. Mostly, though, I have a lot of patience, and would certainly hold a slab for you as you submit the candidate yourself. Since some of these books are virtually non-existent in 9.8, I would probably also consider a trade for a slab of lower grade in the right circumstance. Last edited by AnarchoMambo on Tue Apr 23, 2019 9:42:58 pm, edited 84 times in total. Last edited by AnarchoMambo on Wed Jul 04, 2018 7:09:31 am, edited 1 time in total. WTT: 9.8 Imperium 1 Braithwaite (3 slabs) there are 11 of these on census. I own 4 of them! Anyone for a trade? Last edited by AnarchoMambo on Thu Aug 30, 2018 9:32:12 am, edited 1 time in total. Wow! Nice slabs. Wish I had what you are looking for. Good luck! If you decide to sell, LMK. WTT: Eternity 1 Massafara (2 copies) I love that wraparound! Last edited by AnarchoMambo on Sat Jul 14, 2018 4:56:23 pm, edited 1 time in total. sorry about the pictures, I was having issues with photobucket. I am starting to list my surplus recent high-ratio slabs. Lots of XO Manowar (2017) and Bloodshot Salvation 1:50s available for trade. A real bear to grade! Ah, Bloodshot #3 Lozzi, the "Goldies" issue! Could this be considered a "Gold" book? lol, very doubtful, but still one of my all time favorite covers! Correct me if I’m wrong, but isn’t this David Mack’s 1st Valiant Cover? 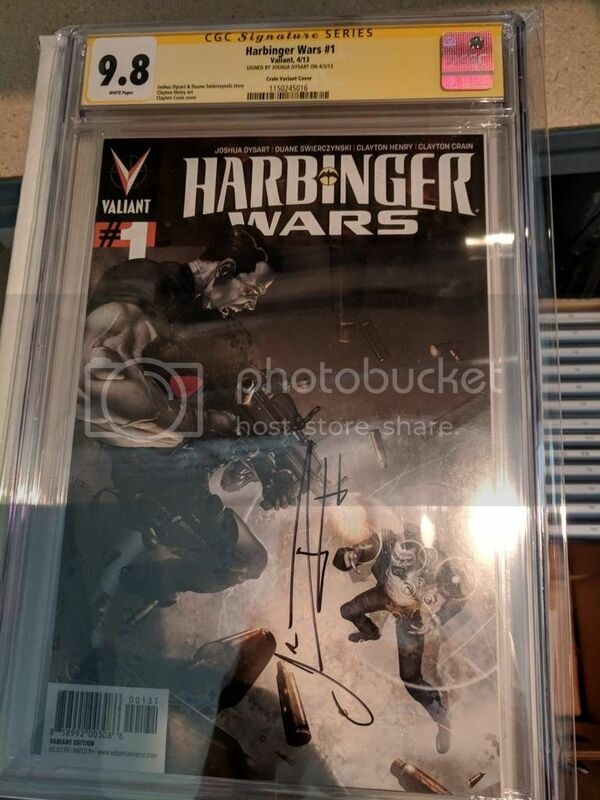 Update: I now have two Harbinger #3 Variants in 9.8 for trade. (yep, I own three) First VEI Livewire. Killer Zircher cover. Some Larosa interiors. What are you waiting for, trade me something! Last edited by AnarchoMambo on Tue Dec 18, 2018 10:39:06 pm, edited 1 time in total. i think I have the only two 9.8s?! Last edited by AnarchoMambo on Tue Dec 18, 2018 10:38:29 pm, edited 2 times in total. I post this because it is a key book and rare in this condition. 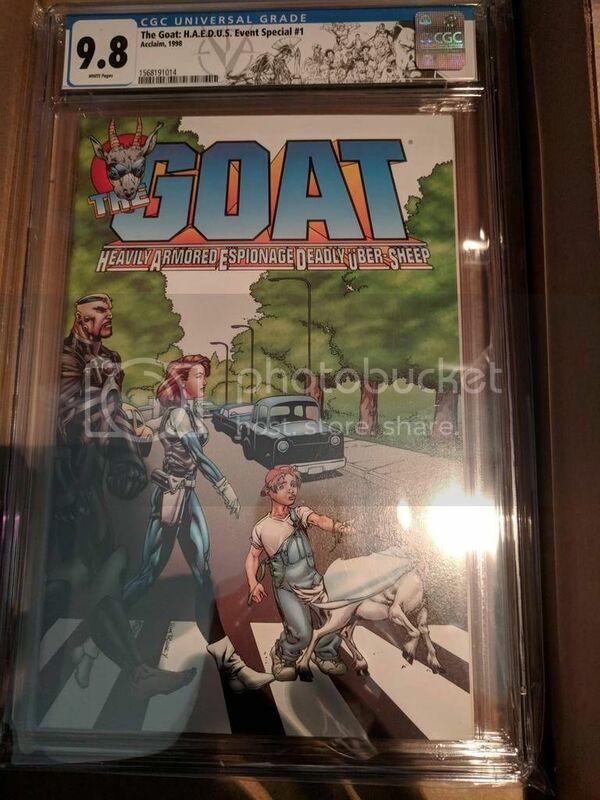 But also because: if you bid on but don’t win this gem, come back here and TRADE ME FOR MINE! (see the thread above) What a deal! Last edited by AnarchoMambo on Sun Feb 24, 2019 10:05:41 am, edited 2 times in total. Which is about 50% (100% in one case) more than the 4 copies in the last 12 months sold for.